Below is Total CS:GO's list of all ranks in CS:GO matchmaking, with rank distributions and percentages. Our rank percentage data is automatically updated every hour. Click on the name of a rank to view more information it, including other names it is called, how good it is and more. The rank group that currently contains the most players is Gold Nova III. 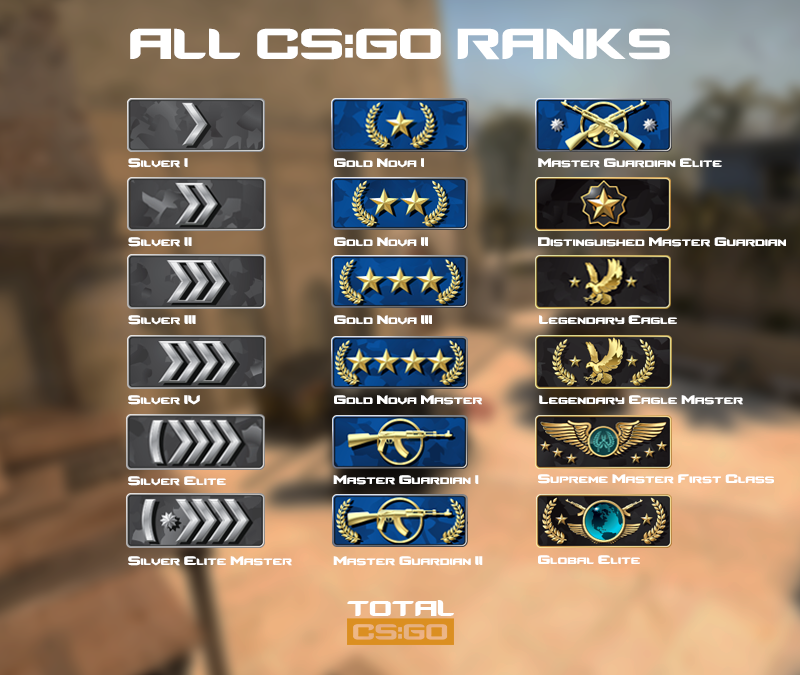 Below is Total CS:GO's rank table, ordered from lowest (Silver I) to highest (Global Elite). List includes rank names and the percentage of the playerbase in each rank. Updated hourly (2018). Below is a bar chart that shows how the ranks in CS:GO are distributed. Below is a pie chart of the distributions of ranks in CS:GO, ordered (clockwise) by lowest to highest. The CS:GO ranking system can be a confusing topic to tackle for new players to the game. You start off without a rank, and after a set number of matchmaking you’ll receive one relating to your skill. But what exactly does this rank mean? What decided it, and where can you go from there? Starting things off at the beginning is how to get your first rank in CS:GO matchmaking. To get your rank, you first need to be level 2 to queue for competitive. You can increase your level by playing the more casual game modes in CS:GO such as deathmatch and casual. Doing so will equip new players with the basic skills they need to play in the more serious matchmaking. Once you’re level 2, you need to win 10 games of matchmaking to be placed into a rank. While you’re collecting these wins you’ll be classed as unranked. After you’ve won those 10 games, you’ll have earned your first rank. This will usually be somewhere on the lower rungs of the list of ranks, but could be higher if you’ve played some form of Counter-Strike before. Silver I is the lowest rank you can receive, and The Global Elite is the highest rank in the game. From that you can see the flow of how the rank system works in CS:GO. There’s no set time where you should earn any of the ranks. Generally speaking, though, beginner players should be somewhere in the Silver ranks, intermediate players should be high Gold Nova/low Master Guardian, and experienced players should be anywhere from Legendary Eagle to Global Elite. Above is an image of all 18 ranks in the game. Ranking up in CS:GO is simple, though the algorithm behind it isn’t. To put it plainly, the more matchmaking games you win the faster you’ll rank up. As you’d expect though, there is more that goes into it than just that. Here is what will influence the speed in which you rank up. What ranks your teammates are. The lower their rank, the more elo (the value that dictates your rank) you’ll earn from a win. What ranks your opponents are. The higher their rank, the more elo you’ll earn from a win. The number of times in a game of matchmaking you are named the MVP. The round difference of the competitive games you play. You’ll gain more elo by beating a team 16-1 than you would if you beat them 16-14. On the flip side, you’ll lose more elo if you get stomped by a team 16-1 than if you only narrowly lose 16-14. This is what affects your rank in CS:GO, but what can you do to ensure you rank up quickly? Well, the best way to rank up fast is to take the time to practise and hone your game. This means instead of jumping into match after match, take some time between them. If you're stuck in a "rank plateau" (unable to move up in the rankings for a long time), or just want to progress through the ranks at a faster rate than you currently are, we have a collection of tips and suggestions to help you rank up. Playing with a friends in a party is a great way to assure that your teammates cooperate and want to win. Starting a solo game, or game with just a single friend, is like playing Russian Roulette - but instead of a bullet firing from a gun, it's whether or not you're queued with a griefer, bad player, or player who doesn't want to play with your team. By playing with your friends, you can assure that everyone has a microphone and wants to play with the team. You can employ strategies like rushes and executes together, and won't have people running out onto bombsites alone with the bomb on terrorist side! Often after losing a game, players immediately rush into another game straight after out of frustration, and hope to win back their lost elo. This is bad because you play a lot worse when frustated (you are less patient, more likely to annoy your teammates, less focused), and also (most imporantly) because you haven't worked out what went wrong in the last game. If you were aiming badly: practice in an FFA or deathmatch server for 15-30 minutes before playing again. If your teammates were the problem: this isn't something you can always improve on, but ask some friends (who are good at CS:GO) to join you in your next match. If you don't have any friends to join you, start sending friend requests to players that you get along with at the end of your future games! If you never had a good weapon (like an AK-47, M4A4, or AWP): make sure you have proper eco rounds in the next game. Other problems include: rushing too much on either side (yes, you can rush too much on T side), not playing with your team, and playing too passively (especially on T side). Everyone has a favorite map on CS:GO. One where they know a few more strats than they do for other maps, or a few more smoke lineups. It only makes sense then that if you’re trying to rank up as fast as possible then you should play these maps the majority of the time. Even better, if you’re a master of one of the maps the community doesn’t play as often like Cobblestone or Train, then you’ll likely be playing against players who don’t know the map quite as well. This is just another small thing you can do to ensure you get the most matchmaking wins possible where you shine as much possible, thus accelerating your climbing of the CS:GO ranking system. Even after thousands of hours, players are still far from mastering CS:GO. There are lots of different aspects and skills required to be good at Counter-Strike (or any FPS), but there are a few crucial skills that you need to practice. Two of those skills are training your aim and practicing smoke grenades. Aim is an important, perhaps even the most important, skill a player can have. Every role in the game requires a reasonable ability to aim in order to succeed. Entry-fraggers have to have amazing aim to out-aim players on bombsites, support players have to have good aim to trade the entry fraggers out, and lurkers have to have good aim to kill players in unexpected parts of the map. Deathmatch and FFA Servers - join a casual deathmatch game, or FFA server from the community server browser and practice your aim here. Aim Botz - this is a workshop map that has lots of bots that you can practice your aim on. You can change settings to make them move, give them armor, etc. You can use this map by going to https://steamcommunity.com/sharedfiles/filedetails/?id=243702660, clicking "Subscribe" (make sure you're signed in), and then in the "Play" menu in CS:GO select "Workshop Maps". Retake Servers - via the community server browser you can join retake servers. Retake servers are servers that repeatedly put players in positions to retake, or defend a site (on CT or T) with the bomb planted. These servers allow players to practice situational aim on different maps, as FFA servers have players playing differently to how they usually would (e.g. playing more aggressively, getting killed from behind, players in parts of the map they wouldn't usually be). Would a football player play with incorrectly sized studs? Or, a tennis player play without the perfect racket? No! There are lots of optimizations, changes, and personalized adjustments you can make to greatly improve your game and peripheral setup. Firstly, make sure that you have HRTF enabled in your audio settings. HRTF allows you to better hear where sound comes from - this comes in especially handy when pinpointing footsteps that you're not too sure of the exact location of. Enable raw input (in CS:GO mouse settings) - this makes the signals your mouse sends go directly to CS:GO, instead of being changed/slowed down by Windows or other applications. Aim for a lower sensitivity - you can do this by lowering your sensitivity by 0.01 every few days until you find the best speed. A lower sensitivity means you can more accurately make small adjustments, like moving your crosshair slightly to the left to make sure you hit a headshot. Have a good quality, big mousemat - this might not be possible if you don't have the funds or room where your mouse is, but a larger mousemat means you have to pick up your mouse less, and a high quality mouse mat will make your mouse more accurate. Disable VSync, or "Wait for Vertical Sync" in the CS:GO graphics settings menu. Remove the FPS cap in the CS:GO graphics settings menu. You can also do this with the fpsmax command. Play in "Fullscreen" mode, not "Windowed" or "Fullscreen Windowed" (better FPS). If you are suffering from low FPS, the settings that will help the most are: FXAA Anti-Aliasing (Disabled), Multi Sampling Anti-Aliasing Mode (None) and Shader Detail (Low).